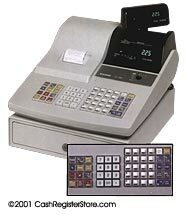 The Casio CE-285 is a low cost cash register with 2 distinct advantages. The advantage the Casio CE-285 has over other similar cost models is the alpha numeric printer. With an alpha numeric printer you are able to customize your own logo stamp and read the description of the items being sold. The second advantage the CE-285 possesses is the RS232 port interface. This interface allows the merchant to connect to their computer and program the CE-285. The CE-285 includes FREE programming video, software and cable. Other excelling features on the Casio CE-280 are the high amount of departments (80), PLU's (600), and sign on clerks (20). A 4 bill, 5 coin cash drawer with removable coin till and pop up rotary customer display are standard on the Casio CE-285 as well. Instructions for programming in Spanish are included with the English manual. (W) 13 ¾"x (D) 15 ¼"x (H) 10 ½"